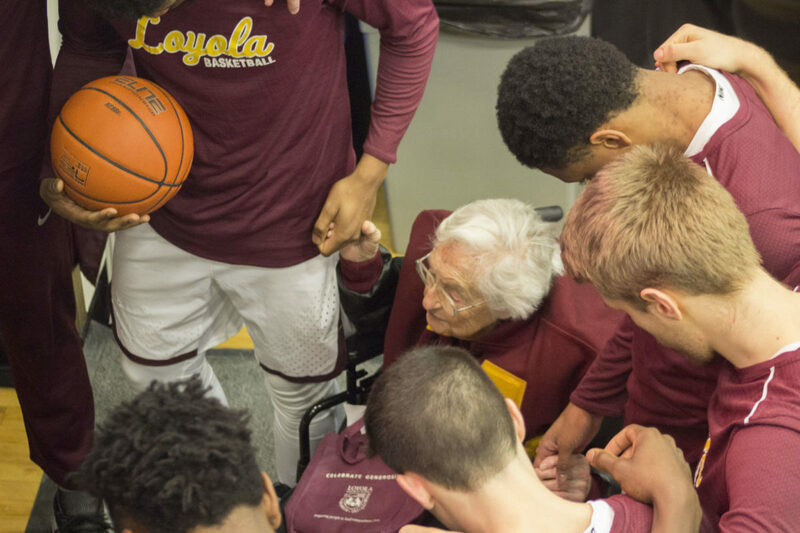 Henry Redman | The PHOENIX Sister Jean leads the Loyola men’s basketball team in a prayer before every game and is one of the biggest reasons why Loyola has seen success in March Madness. So, Papa Frank, please consider this as my formal letter to get Sister Jean canonized. The process to become a saint can take decades or even centuries, so I thought we should get the process started now. The process is long and complicated, but it includes a lifetime of service to God and the candidate has to have performed two miracles. Obviously Sister Jean has dedicated her life to the Catholic Church. She has been working in Rogers Park since 1961 — even before my parents were born. She has advised, taught and helped countless students during her time here, and after retiring from teaching, she guided the spiritual journeys of countless athletes, mostly basketball players. The players and coaches she’s in contact with all talk about the impact Sister Jean has on them. She’s one of the most important figures on Loyola’s campus, especially in the athletics department. I mean, how else do you think she got her own bobblehead? Do any other saints have bobbleheads? Now, to the miracles. I don’t know how popular basketball is in the Vatican City, Pope Francis, but it’s pretty popular here. The NCAA tournament is one of the most watched events in America and millions of people witnessed both in person and on TV Sister Jean’s miracle work. 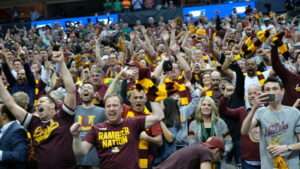 First, the Loyola Ramblers were playing the sixth seeded University of Miami (Fla.) The Ramblers were down one with seconds left and a Hurricane at the free-throw line. Sister Jean’s prayer helped the shot bounce off the rim six times before it landed in the hands of senior Ben Richardson. Her prayer helped senior Donte Ingram go all out for the rebound before falling to the floor. Ingram falling was a blessing in disguise because it meant he could follow the play from behind unguarded. It was Sister Jean’s prayer that helped junior Marques Townes hear Ingram screaming “MARQUES” from mid-court. Finally, it was Sister Jean’s prayer — and Ingram’s perfect shooting form — that helped the ball splash through the net with less than a second left. After the game, Sister Jean could only thank God, or as Sports Illustrated’s Andy Staples put it, her boss. If that isn’t enough proof for you Francis, she had another miracle left in her. In the next round of the tournament, the Ramblers were playing the University of Tennessee. Again, they were down 62-61 with less than a minute left. This time, it was Sister Jean’s prayer that helped redshirt junior Clayton Custer get the ball with just over 10 seconds left. Her prayer helped him drive to the elbow, her prayer helped him lift over the Tennessee defender and get a shot off as he faded away. The ball bounced off the front of the rim and then the backboard, and it was her prayer that helped Custer get the lucky roll as it fell through the net as he watched from his back. It was her prayer again that helped Tennessee’s Jordan Bone miss his last second heave to the hoop and seal the Ramblers’ victory. Sister Jean knows God is on Loyola’s side, but Pope Francis, only you can help the Ramblers get a saint on their side, too. Great article Mr. Redman. Sister Jean has not only created a Mission from God but more importantly shows me what’s really the message. The team and staff have, via interviews, highlights to the world where the new generation is heading. As a baby boomer, St. John’s U alumni , NYC and transplanted to Chicago, this team and school shows this country is better off than many think. Pray Loyola continues and wins the Final NCAA but already, you’re hero’s and examples of a job well done!